Sorry to have been quiet last week, but I was working on the latest book. I still am, which is why this is likely to be a short blog too. However, it occurred to me that I ought to share the results of my last week’s work. I am in the period which I normally think of as the ‘Power Writing’ stage. When I embark on a new story, the first part, finding the best beginning, is always the hardest. It can take weeks to hit the right sort of atmosphere and get the correct momentum so that the reader gets into the story running, if you see what I mean. Then there comes the power writing. This is the stage where everything is still up for grabs. Basically, it means that the story is writing itself. You will have heard of the authors who say that they feel as though they have someone sitting on their shoulder and dictating? This is the power writing bit. It’s easy because the story is still easy enough. For me, it’s a straight line at this point: uncomplicated, straightforward and a doddle to write. If only that stage lasted a little longer! I’m still in the back end of that stage, but now I’m into the headache section. You see, I find that when I’ve passed through the easy bit, I crash and burn against the brick wall of narrative plausibility and logical catch-up. In other words, I suddenly realise that X would never have behaved like that, and Y is actually two hundred miles away when I put him at Nouaillé. Worse, I realise that I killed Z thirty thousand words ago, and yet he’s popped up again now. So, although I’m still working at some speed, this is the time when all the missing links have to be rediscovered in a hurry, and rectified so that as I cruise along to those two wonderful words ‘The End’, I can be moderately sure that the story is functioning! And now, having said that, I have the pleasure of announcing that the next book is now in my hands. BLOOD ON THE SAND is a great adventure, which I hope you’ll enjoy. And in case you have any doubts, you can go to my page here and download THE BOY’S REVENGE free of charge. It’s a short story that is based on Ed the Donkey and his early life. What led him to have such a hatred of the French? What made him leave his home and join the army as a boy? 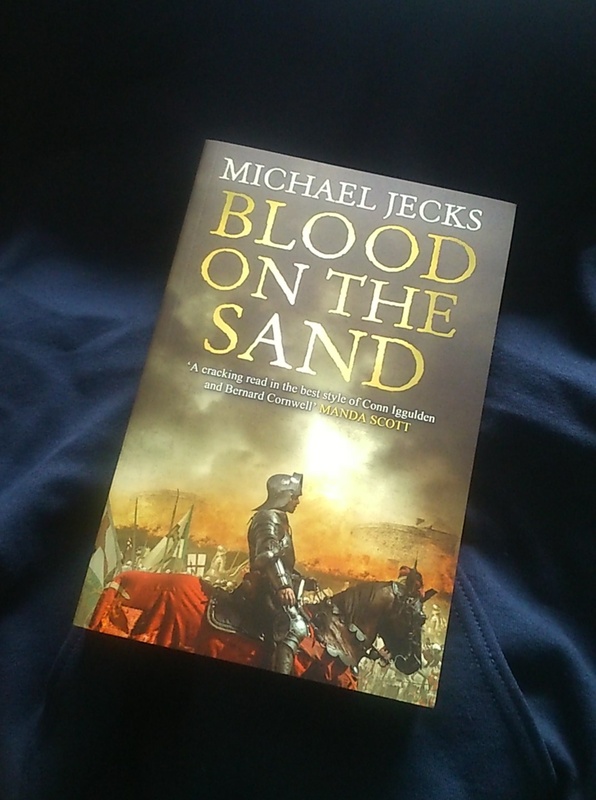 Not only that, you’ll find you have the first four chapters of BLOOD ON THE SAND included. Yes, you have to buy the book to learn what happens later. It’s called marketing. Devious, eh? This week I’m thrashing through the book. Think of the poor author while you enjoy the fruits of his labours! That is a beautiful cover. who is your artist? Hi, Toni – it’s a guy called Stephen Mulcahey and it has his copyright, so I guess Simon and Schuster commissioned him to produce the cover art. Thanks – we like it!